I attempted a new appetizer last night. I was trying to think about some great party appetizers in preparation for Labor Day, BD’s 30th birthday, and football season. I knew I wanted something that wouldn’t be overly complicated, time-consuming, and it needed to be a crowd pleaser for sure. 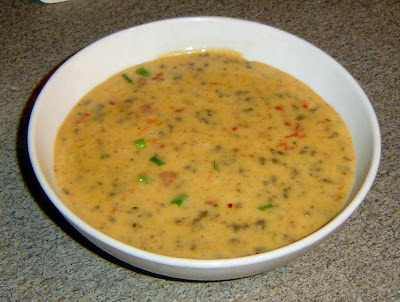 I’d never made a queso dip before (though I have eaten more than my fair share of them), so I decided to give it a go. I figured it would be especially great when I have about 30 grown men drinking and swearing at my TV in the upcoming months while watching a game. *This recipe made a LOT – much more than I anticipated. If you are serving this with a couple of other appetizers you could easily serve 20-25 people. If it’s the only appetizer -maybe 10-15. 1 - Over medium high heat brown ground beef with the onion powder, garlic powder, cumin, chili powder, paprika and 1 tablespoon of crushed red pepper. Once fully cooked drain off fat and set aside. 2 -In a large dutch oven, add onion and Rotel. Sauté for a couple of minutes and then drain off excess liquid. 3 -Add back to pot and add in the cheese. Stir until smooth and all the lumps are gone. 4 -Add ground beef and stir to incorporate. Add S&P to taste. *** At this point I tested the mixture to see what the heat/spice level was. I wanted a lot more kick than it was giving so I added a couple more tablespoons of crushed red pepper little by little until I got the amount of heat I wanted. 5- Right before serving, add the chopped scallions and stir. For serving, I would recommend using a slow cooker or fondue set to keep the dip warm. I was feeling rather ambitious the day I was making this and decided to make my own chips as well. They turned out pretty good and were easy to make, but a little time consuming. Honestly I decided to do them because I had nearly a whole package of uncooked corn tortillas in my freezer that I was probably never going to use otherwise. 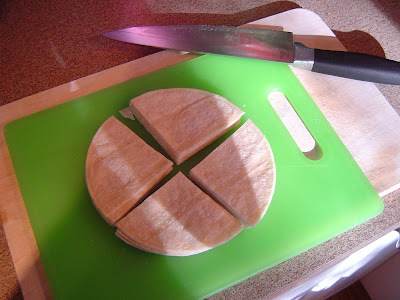 1 - The tortillas were on the smaller side for I cut them into fours. 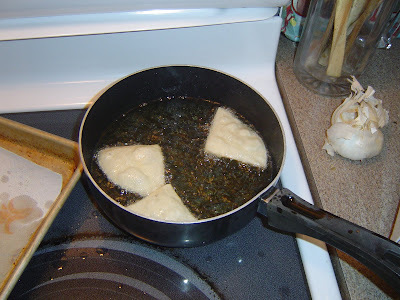 2 – Next I fried in vegetable oil over medium-high heat. 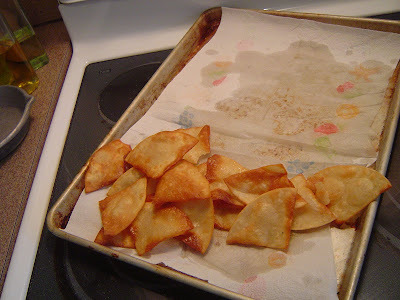 3- I only did a few at a time and made sure to flip them once during the frying. I used a small sauce pan because I didn’t have a ton of veggie oil on hand. 4- Once they had a light brown color, I removed them from the oil and place on a cookie sheet lined with paper towels to cool and then sprinkled with a little salt. I liked how they turned out. Light, crispy, and worked well for my queso. However, after frying them I suspect that my corn tortillas weren’t entirely corn and had a little flour in them as well. Still, they were pretty tasty and I will definitely try to make them again. My thoughts: I really, really, loved the queso. It was really cheesy and had just the right amount of other ingredients. Not only was this good for flavor reasons but it also was important for dipping. As BD said, it had the right consistency and you were able to get a little bit of everything in each bite. I was glad that I added more crushed red pepper near the end because I like things with a bit of a kick. I ate quite a lot more of this than I would like to admit too… so let’s just say that I didn’t have any room left for dinner that night.